Build Sonic the hedgehog and its famous Speed Star from Sonic and Sega All Star Racing video game. Pull back the car and release its amazing power to win the race and the blue emerald. Includes stickers to customise your vehicle. Tool and building instructions included; One supplied; Size H20, W30, D7cm; For ages 5 years and over; EAN: 3273497756003. WARNING(S): Not suitable for children under 3 years old. This toy costs approximately £14.99 (for the latest and best prices make sure you check our retailer list for the Meccano Sonic and Speedstar above). 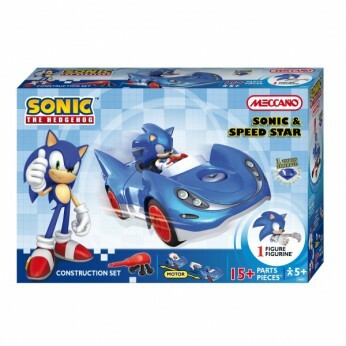 In our review of Meccano Sonic and Speedstar we classed it as being suitable for ages 9 years, over 10 years but recommend you check the manufacturer specific advice before purchasing.